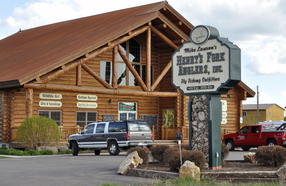 Known the world over for its prolific hatches, challenging trout and spectacular scenery, The Henry’s Fork fishery has no equal and with 40 years of angling experience, Henry’s Fork Anglers has established themselves as the premier fly shop! We strive to provide our customers with the best possible service. We cater to both the experts and beginners, and we will do our best to provide you with the advice necessary to have an enjoyable day on the water. Enjoying your time on the water is the point of fly fishing. We have a wide variety of fly fishing and outdoor gear. Whether you’re an experienced angler or just a beginner we can guide you to the best possible gear at the best prices. We are the only outfitter that can provide fishing licenses in Idaho, Montana, and Yellowstone Park. Make sure you’re fishing legally. Make sure you get your licenses at Henrys Fork Anglers.You can also purchase Idaho or Montana licenses online.